Released by Phonak on November 1, 2018 the Phonak Audeo Marvel Rechargeable 30 falls under Phonak`s essential technology level within the Audeo Marvel Rechargeable family. As essential technology, this hearing aid is the lowest technology that Phonak has to offer, making it a dependable choice for individuals with quiet lifestyles, who primarily wish to hear better around the home, in one-on-one conversations, watching TV, and in mostly quiet and small group settings. The Phonak Audeo Marvel Rechargeable 30 hearing aid has 8 channels and 5 customizable programs, and that gives it the flexibility to digitally process sound in a way that sounds natural, and can also be adapted to the particular listening environment of the wearer. In addition, Audeo M30R hearing aids feature Phonak's newest sound processing algorithm, AutoSense 3.0. The Audeo Marvel Rechargeable 30 is powered by a built in lithium-ion battery, which, when powered overnight, reliably delivers 24 hrs of power to the hearing aid. With a maximum potential gain of 67 SPL, the Audeo Marvel Rechargeable 30 is suitable for individuals with mild to severe hearing loss. With its discreet RIC (receiver in canal) style, the Audeo Marvel Rechargeable 30 sits comfortably behind the ear and is hardly noticeable to the wearer or others. This hearing aid is available in 8 color choices as shown below. If you have questions about the Audeo Marvel Rechargeable 30 that you don`t find answered on this page, or are looking for specs on this device, you might want to check out the downloadable documents (below), visit Phonak`s website, or feel free to give us a call at 800-731-6794. Introducing the Multifunctional Marvel from Phonak! For the first time ever, we have a hearing aid with state of the art background noise reduction, direct and binaural streaming compatible with nearly all Bluetooth® devices, and a reliable rechargeable battery. 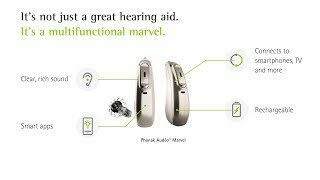 In this video I take a look at some of the physical improvements Phonak has made with the Marvel hearing aid, the new operating system AutoSense 3.0, rechargability and battery life, and of course Bluetooth®, Phonak's Remote App, and TV streaming. Paul’s life is a marvel — he enjoys traveling, spending time with his family and listening to a wide variety of music. 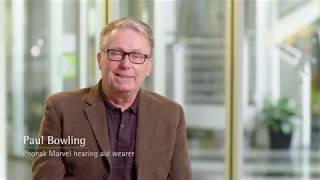 With clear, rich sound and connectivity to any Bluetooth®-enabled devices, Phonak Marvel hearing aids help Paul truly enjoy life. Marvel by Phonak – A multifunctional hearing aid that will make you fall in love at first sound! Are you looking for clear, rich sound, universal connectivity and multifunctionality, all in one? Check Marvel hearing aids by Phonak and fall in love at first sound! The Phonak Charger Case Combi is a charger, drying kit and protective hard case all in one. Additionally, it includes a cleaning tool in the robust and splash-proof housing. Flexible charging options- you can plug the Charger Case into an electrical outlet for normal use or add on the optional Power Pack for seven days of charging in places where electricity is not available. Phonak rechargeable hearing aids feature a built-in Lithium-ion battery that provides 24 hour of hearing with one simple charge. They take about three hours to fully charge, but you can rely on a short 30-minute charge to give you up to six hours of performance. The Phonak Mini Charger Case, with standard USB-C charging outlet, is a compact charger for two Audéo M-R hearing aids. The Phonak Power Pack provides up to seven days of charging, without an external power source, when added to the the Phonak Charger Case. Perfect for charging hearing aids every day for up to a week on trips were no power source is available. The Power pack attaches to the base of the Charger Case RIC, providing reserve power from a battery rather than from the household electrical supply. Now with an on/off switch and supporting Dolby Digital! The easy to use streaming device for TV and music. The TV Connector D is an easy to use streaming device for TV and music. Just plug and play to interface with TV’s and other audio sources, supporting the direct connectivity of Phonak hearing aids. It simplifies setup, usage and offers superior stereo sound quality using AirStream™ technology. With the TV Connector D, you can simultaneously stream audio signals up to 15 meters away, to an unlimited amount of connected hearing aids. The Phonak Remote app turns your smartphone into an advanced remote control for your Phonak hearing aids. To use the app, you'll need wireless hearing aids, like Audéo or Audéo M, that support direct connectivity. Once you have installed the Phonak Remote iOS or Android app on your smartphone, an easy-to-follow pairing wizard will help you connect the app to your hearing aids. You can use the Phonak Remote app to: Change your hearing aid volume and listening program - Balance the volume of wireless streaming and your surroundings - Customize your listening programs - Check out the demonstration mode to experience explore more possibilities. The Phonak MyCall-to-Text app provides real-time transcription of phone calls on your smartphone so you read what callers say as you listen to the call. Phonak wireless hearing aids make it easy to stream phone calls directly to a pair of hearing aids, without touching your smartphone. Now you can also read along as listen to the conversation, just like you would read subtitles on TV or at the movies. MyCall-to-Text app can transcribe calls in more than 80 languages, for any type of phone. The other person does not need the app. The service is free for app-to-app calls, or you can choose a monthly plan to suit your needs for other incoming and outgoing calls. This hearing aid will come with a manufacturer's 1 year repair warranty and 1 year loss and damage warranty. As one of the few authorized Phonak retailers on the web, you can rest assured that no matter what happens to your hearing aids during this time period- you're covered with a full factory warranty. A small docking/recharging station is included. Rechargeable li-ion batteries are supplied with the units (built in). Thanks! Our hours are 7am-5pm PST M-F. We'll call you when we're in!